Este cruzeiro de duas horas ao pôr do sol de Cabo San Lucas parte às 17h no inverno e às 18h no verão. 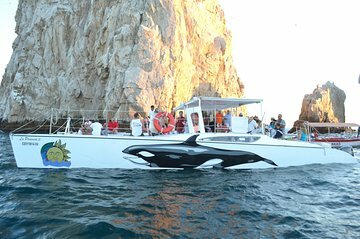 Encontro na Marina de Cabo San Lucas na Doca D.
Embarque em um barco de catamarã e ouça seu guia apresentá-lo a sua equipe e seu capitão. Eles abordarão algumas dicas de segurança que devem ser lembradas e, em seguida, você navegará. Tenha em mente que você pode desfrutar de bebidas ilimitadas, tanto alcoólicas quanto não-alcoólicas, mas você deve ter 18 anos de idade para ser servido de qualquer bebida alcoólica. Viaje pelo Mar de Cortez e mantenha os olhos abertos para leões-marinhos, arraias e outras formas de vida marinha. Passe pela Praia dos Amantes e pelas propriedades à beira-mar antes de fazer uma parada no El Arco para tirar fotos. Esta pedra calcária é bem conhecida pelo seu arco formado pela maré. Continue para o lado do Oceano Pacífico e aprecie o pôr do sol. The crew was very attentive and helpful, even provided woolen ponchos for my friend and her daughter when they noticed both were getting chilly....great service. Just the right atmosphere for a sunset cruise with drinks and snacks. Much cheaper than the other venues out there on the water and we were right out there in the mix with everyone else. The captain did an amazing job getting us right in front for the pictures and wildlife viewing, plus keeping us away from the loud party barges and allowing us space from all the other boats out on the water. Definitely will do this cruise again the next time we are in Cabo San Lucas. Had a great time on the sunset cruise. Wished it could have been longer than 2hrs! We were hoping to see whales (as a bonus), but it seems they are more active in the morning. This cruise is absolutely worth the money, and the crew worked very hard to take care of each guest and see that everyone was having a good time. Some guests wanted to drink and dance. There was plenty of loud enough music for that! Some guests wanted to sit quietly at the front of the boat, and the crew provided blankets when the shadows got long and the wind was brisk. The snacks were a very good guacamole and chips, plus candies. Not much variety but plentiful quantities. The crew showed up reliably 15 minutes before the gate opened to check people in. The whole experience was well managed. The guests ranged from families with very young children, party dancers and older folks. Everyone had a good time. And...the views are wonderful! Fun ! The staff went out of there way to accomodste everyone! It was amazing!! Very beautiful scenery and ambience. Free drinks were provided and good music was played throughout the cruise. It was really well planned and every thing worked out just perfectly. Highly recommended. Had such an amazing time! A lot of fun! The guys are so funny and entertaining. Tip well! We had a great time. The crew were nice and helpful. Would definitely recommend for the price! The cruise itself was safe and fun. The registration was easy and secure. The crew were all fabulous. They were friendly and attentive. They were very good about getting drinks for everyone and refilling them/ getting them more drinks of what people wanted. I would only ask for a little information from the team about the wildlife seen at times/ most unusual sightings. The history of the rocks / El Arco. Some info was shared about the sea of Cortez vs. pacific however, some of the houses and resorts along the way we would have liked to known more about. Crew was good about taking photos, however let the photographer on the cruise take pics of you, she was very good at capturing the right pic at the right time. She is not included with the tips and only gets what she sells. So if she takes your pic and you like it, please buy a professional pic from the photographer, she is talented and friendly just as the crew. We had a great time! Slowly tooling around the bay listening to music, watching the crazy stingrays mobula rays? jumping out of the water, enjoying as many drinks as you want, and the delicious homemade pico de gallo the crew made during the trip. There was even a decently maintained restroom! Would definitely recommend for the price!